Ruth Reichl writes in Garlic and Sapphires, “Restaurants free us from mundane reality; that is part of their charm. When you walk through the door, you are entering neutral territory where you are free to be whoever you choose for the duration of the meal.” Dining at Chabrol provides this illusion, suddenly I’m transported to Southern France, stepping into a quaint café, sipping wine as I joke around with a handsome tattooed French man. 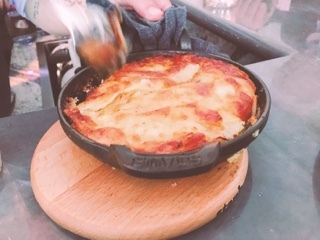 The smell of melting butter and cooking shellfish is intoxicating, I was marveled by Chef Penfold’s ability to produce such delicious creations from two induction burners that makes my four top range at home look palatial. 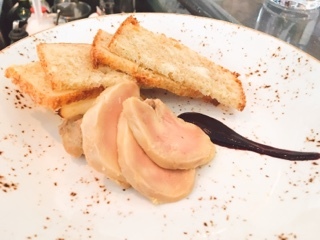 Although the cool riesling poached foie gras ($19) had a silky smooth consistency that simply glided across the tongue, its slightly gamey after taste threw me off. I tried to mute it by using the refreshing black currant sauce smeared on the plate. Baked in parchment paper, the papillote of whitefish ($29) steams in its own juices and leeks infuse their aromatic essence into it. Cooked to perfection, the light fish was flaky and moist. 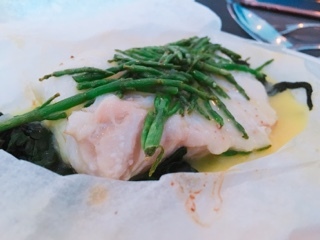 The fish was accompanied with sea asparagus (like thinner French beans) and swiss chard before being topped off with vermouth beurre blanc at the table. 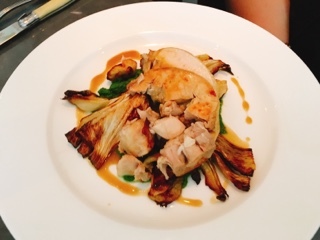 The ballotine of chicken ($29) was the sole disappointing dish. To be fair, my dinner companions enjoyed it and perhaps it’s because I tasted the chicken last and received an end piece but found the meat dry and tasteless. Trying to revive the chicken by dipping it into the vibrant green watercress soubise was no help as my taste buds have a heightened sense for bitter flavours. At least the roasted fennel and apple were good, but these sides can hardly save an entire dish. 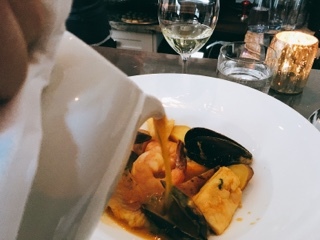 All can be forgotten as Chabrol’s ttoro ($29), a bouillabaisse from Southern France, is simply sublime. The rich seafood broth is infused with green peppers, garlic and such a well-rounded feel from saffron. As the soup is dispensed at the table, the fragrance is so tantalizing that it took immense self-control to not dig in while the pouring continued. Of course, the seafood was well executed: the fish flaky, the mussels juicy and shrimps sweet. 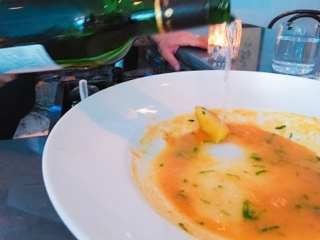 Best yet, with the dish, the sommelier gave us a lesson as to what Chabrol means: essentially adding a splash of wine to dilute the remaining broth, bringing the bowl to your lips and finishing everything off straight from the bowl. We didn’t gulp the remnants, instead using it to dunk more of the great in-house baked crusty bread into. Forget letting the alcohol burn off, the remaining concoction tastes of wine, a dish straddling between food and drink. Do yourself a favour and get an order of the potato gratin ($12); not only does it smell amazing, the taste rendered me speechless. The thinly sliced potatoes are covered with a rich cantal cheese mixture (a semi-hard cheese that’s similar to aged cheddar) and thyme. Getting an order of this with a side salad would make for a perfect meal in itself. 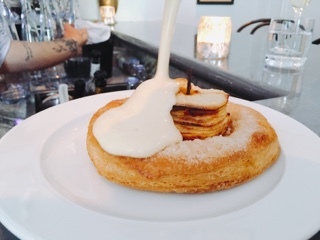 After hearing so much about Chabrol’s apple tarte ($13), I couldn’t leave without trying it. 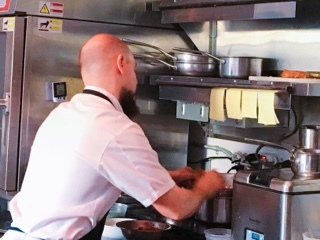 Chef Penfold painstakingly stands over a double boiler whisking together eggs, sugar and calvados (an apple brandy produced in Normandy) until it becomes a smooth luscious sabayon. Indeed, it takes a while, but it’s well worth the wait and if you’re in a rush just order the dessert before the mains are complete. The large disc of puff pastry is airy and crisp; despite the strong buttery essence it wasn’t greasy. Ample amounts of paper-thin apples rests on top and the liberal dusting of sugar sweetens it just enough. It’s a fantastic dessert, the best I’ve had over the last year. Normally, I’d prefer sitting at a table, but gathering around the bar makes for such a jovial atmosphere. Where else can you joke with the handsome sommelier and converse with other diners? Even Niall McCotter, co-owner of the restaurant, swung by a few times to chat with us. 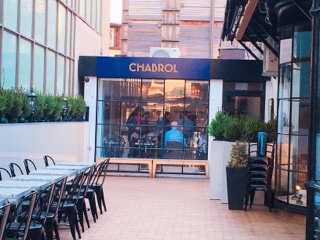 He informed us that in the summer Chabrol will be expanding outdoors with an additional 20 seats, an outdoor kitchen and a champagne cart (which may or may not be manned by McCotter himself). Thank you Chabrol for the delightful dinner and for a couple of hours freeing me from the cold Toronto winter … instead transporting me into a warm and welcoming French café.